Our aging processes begins as we reach the age of mid-20s due to both internal mechanisms such as loss of ‘filler’ components, hyaluronic acid and collagen, and lifestyle factors causing aging signs, wrinkles to appear, along with a loss of volume and radiance. The facial skin hence appears older and saggy with every passing year while altering facial shape and structure. These features together form a harmonized facial structure that wide from the top, narrowing down to the chin with a calm and positive outlook. This is why the triangle of beauty symbolizes a young, gorgeous face. These are the signs of aging that invert the triangle. The wider area remains at the lower area of face. As volume diminishes and skin sags, the facial outlook is also changed to a sad, stressed appearance. Levels of hormones such as oestrogen decrease with age causing a loss in volume and definition to facial outline. Habits such as smoking and spending long time under sun cause decrease in collagen and elastin while accelerating aging process. The formation of free radicals weakens cellular structures which help in maintaining skin’s smoothness and definition resulting in loss of volume, density and radiance and wrinkles become prominent. Over time the skin loses hyaluronic acid from the epidermis and collagen from deeper layers of skin (1% yearly decrease). The skin begins to forms wrinkles, loses moisture, and becomes more sunken with hollow cheeks. Despite the fact that the loss of volume and appearance of aging signs are unavoidable, these issues can be treated by both surgical and non-surgical procedures. Surgical and non-surgical cheek augmentation treatments help in enhancing the appearance of natural flatness in cheek bones and also restoring lost facial volume which occurs due to aging. The procedures for cheek augmentation are safe, cause least discomfort, beautify definition of cheeks and contribute in boosting your self-esteem. Cheek augmentation or enhancement can also be carried out in conjunction with another procedure such as facelift, brow lift, rhinoplasty, or eyelid lift for a renewed, youthful look. With age, our face loses fat and hence volume, making cheeks look gaunt and sunken. While some people may have flat cheekbones due to genetics, cheek augmentation can correct both these conditions. Facial implants for the cheek augmentation can harmonize facial symmetry while improving its contour. These implants can also be carried out for chin area. What makes cheek augmentation unique from other cosmetic surgery treatments is that it requires least surgical penetration. Malar: Applied directly on cheek bone for a greater facial outline. Submalar: Used to correct sunken cheek appearances by enhancing middle area of the face. Combined: Combination of both, covers both mid-face and cheekbone areas. Cheek augmentation and implant surgery uses general anaesthesia and takes about one to two hours to fully complete while recovery time normally takes about ten days. Cheek implants surgery results have been seen to have high satisfaction levels. A vast majority of patients get successful, vivid results. The cheekbone injections provide a non-invasive and cost effective solution to cheek augmentation. As an alternative to its surgical counterpart, cheek augmentation can also be performed using fillers for restoration of volume loss due to aging or adding definition. The cosmetic surgeon or expert dermatologist injects dermal fillers such Restylane or Juvederm at the cheekbone area. 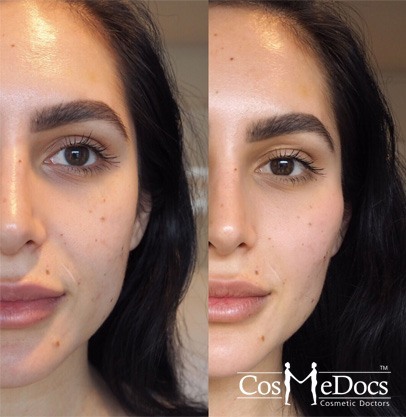 With the several varieties of cheek fillers being available in the market, each of its types provides different effects as well as their longevity which may also vary. Cheek fillers enhancement hardly take 20 minutes to complete. Downtimes doesn’t exceed more than a day. It takes almost 3 weeks for changes to become more visible which last for around 6-12 months or more. How To Decide Whether I Should Have Cheek Implants Or Fillers? A consultation before treatment will help you decide it as your cosmetic surgeon thoroughly examines your facial dimensions and shape while asking you about your desired outcome with cheek augmentation. Further you will be informed about any possible complications and how much the procedure should cost. What Are Potential Risks With Cheek Implants? Mild to moderate levels of discomfort can be an issue. In that case, ask your surgeon to prescribe an analgesic. Swelling and bruising could occur along with some extent of numbness which typically fades within one to three months. However, there is the risk that the implant may slightly move which would require an additional surgery to reaffix its position. In case if you do not get desired results, a revision surgery or removal of implant will be needed. Scarring may appear but it depends on the type and area of incision your surgeon uses.